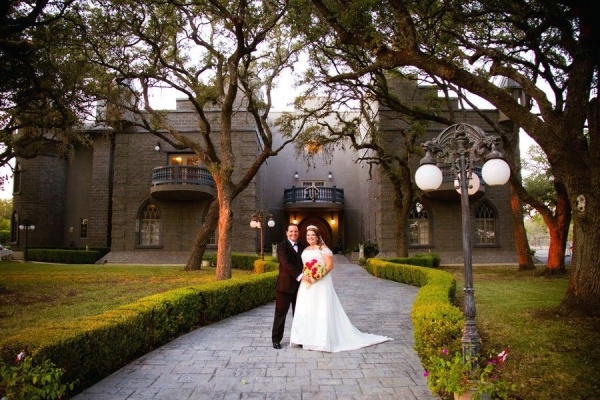 Christina and Tony got married at the beautiful Castle Avalon in New Braunfels TX. Their wedding date was one of the most anticipated dates of the year: 9/10/11. The couple chose to have a very elegant and intimate ceremony in the Gardens, and then the Grand Ballroom for the reception. Christina picked white and gold for her colors, with a pop of hot pink. The wedding party looked so perfect against the beautiful sunset. A simple but very sweet ceremony was excellent for this endearing couple. The ballroom was decorated simply but perfect. The table linens were light gold embroidered satin, they all had gold chargers and folded white napkins. Atop the napkins were the simple Jordan almonds in white tool with a pink ribbon. The centerpieces were tall gold candelabras with white votives. The guest got to enjoy the delicious food prepared by Christina’s family during the cocktail hour and a filling buffet. After that, the father of the bride gave a wonderful toast, they cut the cake, and the party began. All the guests had a great time dancing and socializing. At the end of the night the couple left though a shimmering cascade of bubbles and cheers as they rode off in a carriage. It was the prefect end to this fairytale day. Congratulations to Tony and Christina!